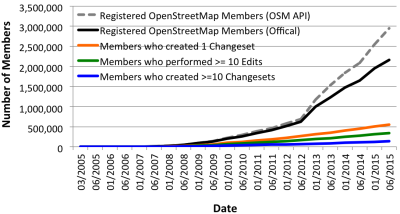 OpenStreetMap Crowd Report – Season 2015 : Neis One! The following chart shows a trend similar to the one of previous years: The project attracts a large number of newly registered members, but the sum of contributors that actively work on the project is fairly small. As mentioned in earlier posts, this phenomenon is nothing special for an online community project and has been analyzed for previous years already. 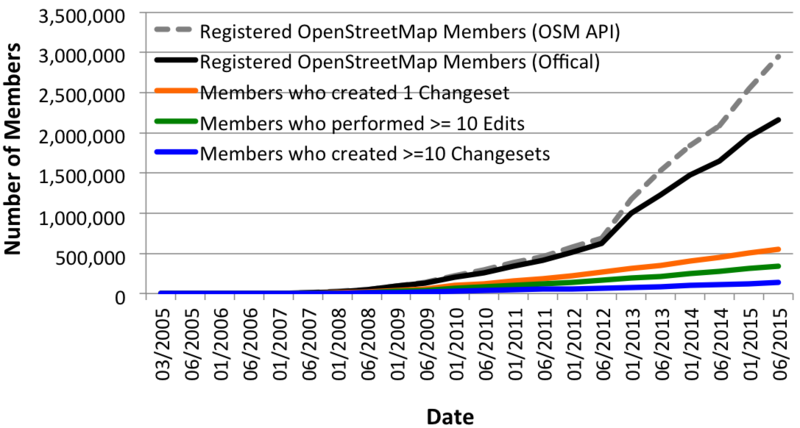 Personally, I really like the following diagram: It shows the increase in monthly contributor numbers over the past few years and their consistencies in collecting OSM data based on the first and latest contributed changeset of an OSM member. It’s great to see that at least some experienced mappers are still contributing to the project after more than five years. Some background information on how I created the stats: To retrieve the registration date of the members, I used the aforementioned OSM API. The other numbers are based on the OSM changeset dump, which is available for download here. Next to the presented results above, you can find some daily updated statistics about the OSM project on OSMstats. Thanks for the analysis! I am just wondering why there is this heavy drop for each group after a year of contributing. I would have expected an almost smooth decrease of contributions over the time as you can see it for the two oldest groups (2008 and 2009) where we cannot see what happened at the point when the contributors of the following year started mapping. Maybe I am misinterpreting that gap, but I suspect that there might be a mistake in the visualization. One last question: You are working a lot with changesets that you are analyzing in a postgres database. I am quite new to postgres and wondering whether there is a tool to easily import the changeset dump to a postgres database available anywhere. I imagine that the graph is correct. The drop off is when you go into a new year. Most contributors only make 1 edit or a few in a short period of time. So dec 2014 there are say 10k contributors all in the grey colour as they all registered in 2014, the vast majority of these are new. In Jan 2015 there are only a few thousand that registered in 2014 that contributed again. Where there are say 10k new users all of them new. Good point! That should be the correct interpretation! Thank you. There is already one way of classifying the contributors, but it is based on the changesets. This does not correctly reflect the actual mapping effort: If a mapper has the habit of saving more often, the number of changesets goes up. IMHO each POI and shape (closed way) should be considered equivalent effort, as both actions add roughly the same value to the map. 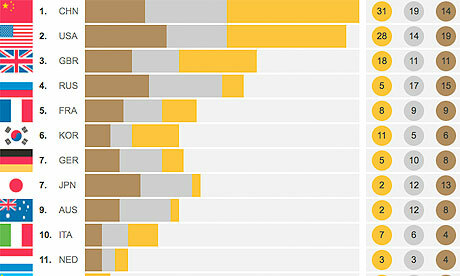 It would be great to see a chart with the number of different types of contributors from each country. Something like the medal tally at Olympics.